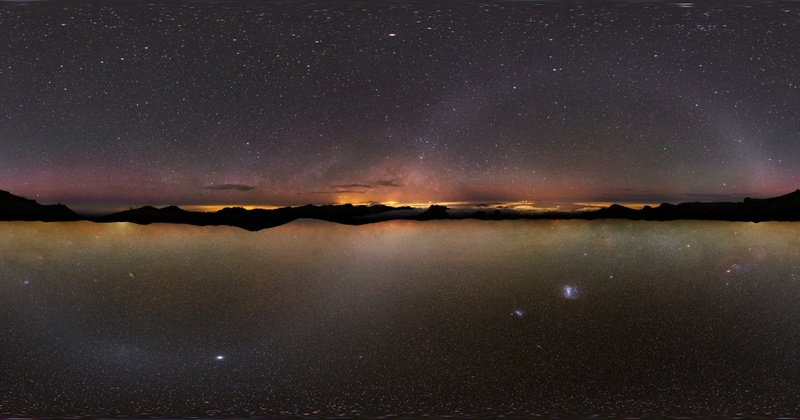 Explanation: A quest to find planet Earth's darkest night skies led to this intriguing panorama. In projection, the mosaic view sandwiches the horizons visible in all-sky images taken from the northern hemisphere's Canary Island of La Palma (top) and the south's high Atacama Desert between the two hemispheres of the Milky Way Galaxy. The photographers' choice of locations offered locally dark skies enjoyed by La Palma's Roque de los Muchachos Observatory and Paranal Observatory in Chile. But it also allowed the directions to the Milky Way's north and south galactic poles to be placed near the local zenith. That constrained the faint, diffuse glow of the plane of the Milky Way to the mountainous horizons. As a result, an even fainter S-shaped band of light, sunlight scattered by dust along the solar system's ecliptic plane, can be completely traced through both northern and southern hemisphere night skies.